Roof replacement is a big, expensive job, so do your homework to make sure you get the most out of your investment. Understanding the process and the types of roofing materials available is essential to making the right decisions for your home. Here is a helpful little roof replacement guide. Once every year, examine your roof. You don’t have to get up on top of the roof to check it out; stand on a vantage point where you can see the entire roof — possibly a neighbor’s yard — and scope it out with a pair of binoculars. Look for signs of wear and tear that include shingles that are cracked, broken, curled or missing, rust spots on flashing, moss and lichen growth, and any discoloration and peeling paint under eaves. Pay special attention to any branches that are touching or within five feet of your roof. In stiff winds even branches that are several feet from your roof can rub against roofing surfaces, wearing away the protective layers, lifting shingles, or even puncturing the roofing materials. Trim back all branches. Inside the house, look for dark spots on ceilings and walls. These signs that moisture is entering your home and that your roofing may have a leak. 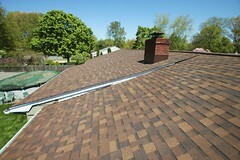 Small trouble spots can be fixed with a shingle repair or replacement rather than a full roof replacement. If your roof isn’t steep (a pitch defined by the National Roofing Contractor’s Association as 25%, or 3-in-12 or more), and you’re not afraid of heights, you can attempt these simple repairs yourself. Take every safety precaution when working on a roof. If you don’t feel comfortable, just contact a reputable roofing contractor. If you have asphalt roofing shingles, one of the surest signs of an aging roof is finding piles of granules inside your gutters. These colored mineral granules coat the surface of asphalt shingles and help protect them from sun and hail damage. As the shingles age, these granules loosen and are washed into the gutters. Knowing the age of your existing roofing puts you ahead of the game when it comes to determining if you need a replacement. 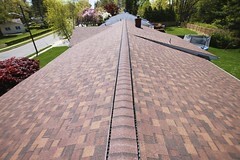 The overwhelming majority of roofs are asphalt shingles, which generally have a life expectancy of about 20 years. 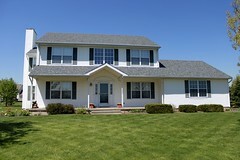 Asphalt shingles generally perform better in cooler climates. In warm, southern regions, lifespan of asphalt shingles may be as little as 10 to 12 years. Other types of roofing, such as wood shingle and metal, have considerably longer life expectancy. When the time comes for roof replacement, you’ll need to decide if you want to tear off the old roofing. A single layer of existing asphalt shingles in good condition can be roofed over once, but an existing second layer and other types of roofing materials must be removed before new roofing can be installed. While it may save money to add a second layer of roofing without the expense of tearing off the old shingles, keeping the existing roof means keeping the old flashings and vent boots, which are generally considered the weak link in your roofing system. The new flashing and vent boots that accompany a clean roof replacement ensure the best possible protection for your home and generally are worth the extra cost of a tear-off. Roofing materials are sold by the “square,” a measurement equal to 100 square feet. An average two-story, 2,500-square-foot house with a 4-in-12 pitch roof requires about 1,500 square feet of roofing, or about 15 squares. When estimating, add 10% to 15% for waste. 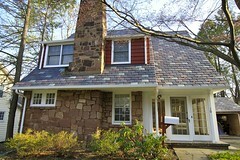 Biondo Contracting is a roofing company that offers Roof Replacement services, roof installation services, roof repairs, siding services, and many other roofing services to the Central NJ area in towns such as East Brunswick, Livingston, Short Hills, Point Pleasant, South Brunswick, Hillsborough, Bernardsville, Bridgewater, Green Brook, Madison, Somerset, Millburn, Bay Head, Springfield, Manalapan, North Brunswick, and many more. For more information on this expert NJ roofing contractor and it’s services, or for a free roofing estimate, call Biondo contracting today at (732)257-2926 or visit the website.